The Crossover's Front Office takes a look at some of the best international NBA draft prospects at the 2018 Basketball Without Borders camp. 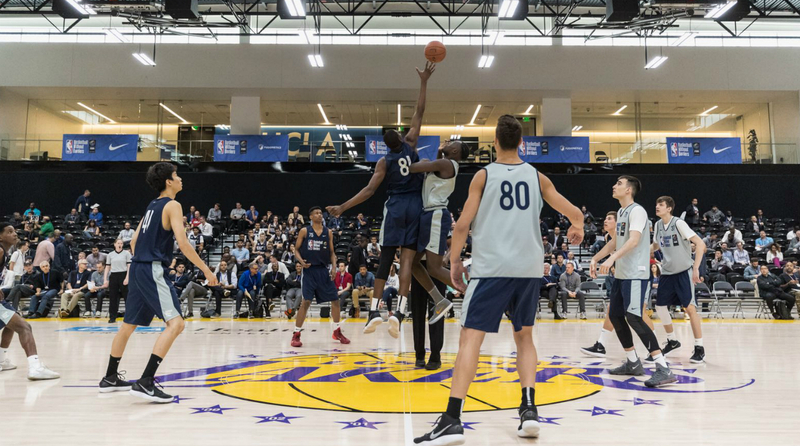 LOS ANGELES — The NBA wrapped up another successful iteration of its Basketball Without Borders Global Camp over the weekend, bringing together many of the world’s top teenage prospects and mixing them together into a development-oriented setting. A whole host of scouts and executives from all 30 NBA teams attended the three-day event, which moves each year with All-Star weekend and has become a must-scout opportunity, also including elite international girls prospects for the WNBA to evaluate. Staffed by an experienced group of NBA coaches and basketball personnel, there is an emphasis not only on skills and scrimmaging, but life skills as campers move toward pro careers in the U.S. and elsewhere. The level of competition was strong, peaking on Day Two as players gained comfort in their environment and adjusted to their busy schedules. The Crossover’s Front Office was present for all three days of camp, laying eyes on many of the prospects for the first time. Out of 42 boys from 29 countries, here are the players who set themselves apart, headlined by a pair of potential first-rounders for the 2019 draft. Born in Guinea, Doumboya moved to France as a child and helped lead the team to gold as one of the younger prospects at the U18 Euros in 2016. Perhaps the best all-around athlete among this year’s BWB campers, Doumboya is tracking as an early first-round selection for next year’s draft. Possessing a rare combination of power and skill, he plays above the rim with ease, throwing down explosive two-handed slams and gathering quickly in space off one or two feet. When attacking downhill, there were few players who could stay in front of him. Despite lacking great change of direction due in part to his handle, Doumboya’s burst got it done in this setting. His lean, strong frame should be able to fill out, and he was arguably the top prospect at the camp. Doumboya displayed nice shooting touch and a soft, easy release on the perimeter that looked consistent all weekend. He has considerable upside in that area, and while right now it’s more of a set shot, he has the requisite body control to develop into a capable shooter on the move. His developing handle and passing skills suggest he could play either forward position down the road. He’s instinctive reading the ball off the glass and may be best suited as a mismatch-type small-ball four in the NBA, and defended quite well on the perimeter when locked in. Doumboya was noticeably among the more vocal campers, as well. He told the Front Office he patterns his game after Paul George. The hype appears to be warranted. Currently plying his trade for FC Barcelona’s junior team, Samanic showed up in El Segundo with a lofty reputation after winning MVP at last summer’s FIBA U18 European Championships. His father played professionally at a high level overseas. He’s quite a talent, blessed with great vision and able to handle, spot up and score at all three levels. Though not elite laterally, he’s smooth and has quality fundamental footwork that enables him to get where he needs to go and easily attack the basket off one or two dribbles. His performance was up and down throughout the weekend, but when engaged, Samanic’s potential was evident. With a nice blend of size, skill level and overall floor comprehension, Samanic should be able to handle either forward spot down the line. In an interview with the Front Office, he expressed his comfort level playing all five positions. He can handle on the perimeter or slide down to the interior, and while his jumper is still developing, he looks comfortable with his release and simply needs to work on consistency. Samanic should end up in the first-round conversation in what presently looks like a thinner 2019 draft. Bassey won the camp MVP award with productive play over the course of the weekend, and headlined an extremely strong group of big men. He’s bounced around American high schools, currently playing at Aspire Academy in Kentucky, but is considered one of the best prospects in the high school class of 2019 and reinforced that ranking over the weekend. He possesses immense physical ability, with a thick, sturdy build that’s still maturing. He profiles as a dynamic rim-runner if everything breaks correctly, with the length to defend the basket and elevate in the paint. Bassey’s skill level has improved since we saw him last year at the HoopHall Classic, and he showed some level of jump shooting ability and was able to lead fast breaks on a couple of occasions. That said, not facing great competition in high school and it’s a little unclear exactly what of his improvements will translate into real, structured game situations at this stage. His shot selection was occasionally questionable and it does beg the question as to how he perceives himself a a player—but Bassey is young enough to think he’ll figure that out. Western Kentucky, Kansas and UCLA are among the schools recruiting him at this stage. Clearly the top guard in attendance, Hayes is a natural playmaker and stood out on both ends of the floor all weekend. Born to an American father and French mother, Hayes was the second-youngest player at the entire event but displayed a highly advanced feel for a 16-year-old, firing timely passes and picking his spots well offensively. His teammates seemed to enjoy playing with him, and his ability to create off the bounce meant easy baskets for his team. Equally impressive was Hayes’ aggressive on-ball defense, as he generated turnovers and denied dribble penetration while using his length to apply high pressure. Accounting how much he appears to enjoy competing on that end, he could be up to defending three positions on the perimeter in due time. One of just a few left-handers at the camp, Hayes looks comfortable shooting jumpers and should be able to gain added consistency as he develops, although his shot comes out of his hand a bit sideways which could eventually pose issues. He came in as a known entity and certainly helped himself with his overall showing, turning in a particularly strong second day of camp before sitting out much of the third with an apparent minor leg injury. He told the Front Office he patterns his game after Manu Ginobili, and that he’s used to functioning mostly at shooting guard with his club team, Cholet. The game already comes easily to him, and he’s on track for eventual first-round consideration. The youngest player in attendance, Dante boasts enviable tools for a rim-protecting, interior dive man and continues to flash big-time talent. Currently prepping at Sunrise Christian, Dante has a well-developed, wide frame and managed a number of explosive dunks gathering off two feet. Skill-wise he’s a work in progress, particularly when it comes to post footwork. Right now he can hang his hat on his athletic frame and activity level in the paint. He has the size and length to be a terrific anchor on defense. There’s a long way to go, but Dante has the full attention of NBA scouts. Kansas and LSU are among the colleges involved. Green had several of the weekend’s best highlight dunks and has elite-level verticality to his game, able to take off and finish from outside the paint and make a strong impact in transition. He’s spent the high school season with IMG Academy, and has a host of top-tier college offers. He certainly took advantage of his opportunity with NBA scouts watching, showcasing his explosion and flashing an improved handle. While Green has a ways to go in terms of creating his own shot, he has potential to be a two-way wing player if all breaks correctly. Lawson was one of the better athletes on the floor this weekend, displaying some twitchy bounce and offensive feel as a ball-handler. He’s extremely skinny, with a similar build to Patrick McCaw that gives him some promise defensively. His versatility is intriguing if he can pack on muscle over the next few years. He showed a solid handle and was able to attack the paint and deliver some nice passes with either hand. Lawson hit some shots from outside and spent a lot of time on the ball, and though he’s not a natural point guard, he could evolve into a secondary playmaker. He doesn’t elevate much on his jumper and needs to become far more consistent in that area. He has offers including Oregon and SMU, visited Kentucky in December, and is scratching the surface in terms of what he might become. One of the most unique players at the camp from a physical perspective, Eboua has broad shoulders, thick legs and extreme length (he’s been measured with a 7’2” wingspan) that could make him an exceptional defender. He’s physically reminiscent of a young Ron Artest, and makes instinctive plays above the rim on either end of the floor. He may be stuck between positions at the moment, lacking the ball-handling skills and confidence to operate on the wing against better competition and also the interior feel to play as a four. Eboua did flash a bit of shooting touch, but is far from a consistent threat. He’s mostly limited to straight-line drives and energy points around the basket. Currently at Stella Azzura Academy in Italy, he’s still very early in his development and will be a name to follow over the next couple years. Faye was one of the more physically intriguing players at the camp, with a strong build and quick bounce off the floor that led to a number of eye-popping dunks. He’s developing in Spain with Gran Canaria, and had a breakout weekend in front of NBA scouts with his ability to run the floor, finish and block shots. Faye consistently played with fire and showed good overall instincts playing mostly in traffic. He doesn’t have much of an offensive skill set yet, but put himself on the radar simply by playing the right way and making plays for his team. There’s a place in the NBA for bigs with his traits. One of the clear standouts on day one of the camp, Samuel performed well when his motor was running and has the makings of a versatile forward, able to compete athletically as a big and also step out and knock down the occasional shot. It looks like he may be stuck between positions at the moment, but his ball skills aren’t bad and his powerful leaping ability stood out. His handle is functional attacking the rim, but he lacks necessary level of shake to play the three in college at this stage. His effort level and body language waxed and waned, and the consistency of his play with them. Set to graduate from Wasatch Academy in Utah in 2019, Samuel is set to take the high-major college route. Already committed to Gonzaga for next year, Petrusev is a fluid, smooth-shooting stretch big who should be a perfect fit in Spokane. He’s teammates with potential 2019 No.1 pick R.J. Barrett at Montverde Academy, and was able to shine with some nice moments in the camp environment. He’s not a surefire NBA guy, but has the size and shooting tools going for him and will be in a great situation for his development. After helping lead Serbia to a title in last summer’s U18 Euros, Petrusev is a player to track long-term with some projectable utility at the NBA level. Perhaps the top pure shooter at the camp, Bolmaro was a constant threat from outside and played with a nice level of confidence and feel with the ball in his hands. He was consistently impactful and has the requisite size for his position, if not top-tier athleticism. Bolmaro is a player to monitor as a potential shooting specialist as he matures.